Giles Peckham’s Daring Dauntless won the class with a day to spare, racing with his wife Jane, Milo Carver and Richard Romer-Lee. Dauntless was out again today, taking a seventh race win of the week. Jeremy Preston’s Defender and Roger Marwood’s Audax finished the series tied on 22 points, with the tie break for second overall resolved in Defender’s favour, thanks to her second place in today’s race. Racing in the Solent is often seen as requiring extensive local knowledge, but the top competitor across the Black Group classes emerged as a Dutch boat, Caroline van Beelen and Rutger Krijger’s J/109 Jack Rabbit. They started with a straight run of first places, before scoring a third in the final race that they were able to discard. Simon Perry’s Jiraffe took second overall and Christopher Sharples and Richard Acland’s Jumping Jellyfish third in the 17-strong one design class. 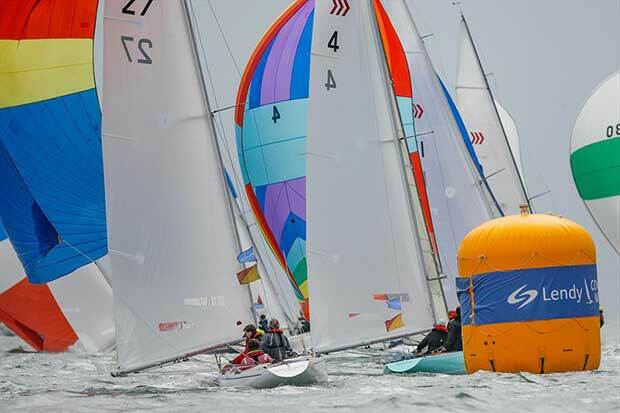 The 100-strong Squib fleet raced for its 50th Squib National Championship at Lendy Cowes Week. Steve Warren-Smith and Stu Rix’s Aquabat emerged victorious after five tight races, winning the series one point ahead of Nigel Grogan’s Helmut Shoing ll. There was an equally close battle for third place, which went to Josh Metcalfe and Mark Hogan’s Rico’shea, just ahead of Malc Hutchings and Andy Ramsey’s Lady Penelope. “Consistency was really important, especially in the first four races that counted,” says Warren-Smith. “That meant we weren’t holding a big discard when we had a bad race on Thursday. Who you choose to sail with is also important – Stu Rix is calm and unflappable, which is exactly what’s needed in such a big fleet. Peter Morton’s Fast40+ Girls on Film won the Duke of Edinburgh Triple Crown Trophy for the biggest yachts that have been competing for three of the most prestigious trophies in the sailing world over the last three days. Morton finished the series just one point ahead of Tony Langley’s TP52 Gladiator. Igor Yakunin’s Ker 46 Lady Mariposa and Michael Bartholomew’s GP42 Tokoloshe tied on seven points, with the former taking third place overall on count back. Gladiator also won IRC Class 0 overall, having never finished a race outside the podium, while Bertie Bicket’s Swan 42 Fargo took IRC Class 1 ahead of Philippe Frantz’s NMD43 Albator and Johan Gustavsson’s Ker 39 Vencom. Adam Gosling continued a long-running winning streak with his latest boat, the JPK1180 Yes! taking victory in IRC Class 2 by a three point margin. In the tightest possible battle for second place, Christopher Daniel’s J/122E Juno finished tied on points with Tony Mack’s J/111 McFly, with the tie break resolved in Juno’s favour. Paul McNamara and Tony Lowe’s First 40.7 Incognito took overall victory in IRC Class 3, ahead of Arianne van de Loosdrecht’s Max Fun 35 Team Heiner lll and Royal Ocean Racing Club Admiral Andrew McIrvine’s First 40 La Reponse. Team Heiner lll’s performance was sufficient to win both the Musto Young Skippers Trophy and the Land Rover Under 25 Trophy. IRC Class 4 was won by another previous class winner with a new boat, David Franks’ J/112E Leon. He finished the series with a straight run of first and second places, to count six points and finish five points clear of another J/112E, Chaz Ivill and Paul Heys’ Davanti Tyres. Ed Fishwick’s Sun Fast 3600 Redshift Reloaded finished third overall, two points adrift. Phil Plumtree’s Half Tonner Swuzzlebubble dominated the front of IRC Class 5 to win with a day to spare ahead of Harry Heijst’s S&S41 Winsome. Andy and Annie Howie’s J/97 Blackjack ll slipped into third place overall, half a point ahead of Peter and Sarah Hodgkinson’s X362 Sport Xcitable. IRC Class 6 was won by Giovanni Belgrano’s 38ft Laurent Giles classic Whooper, which finished the series on six points. Toby Gorman’s Sigma 33 Stan the Boat took second place ahead of Keith Simmons’ IRC optimised Hunter 707/IRC24 Bob. In IRC Class 7 Kevin Downer and Tim Eccles’ modified Jeanneau Fun 23 Ziggy ended the regatta two points ahead of Ian Handley’s Mustang 30 Gr8 Banter, with Paul Dunstan’s Folkboat Mandarin taking third overall. 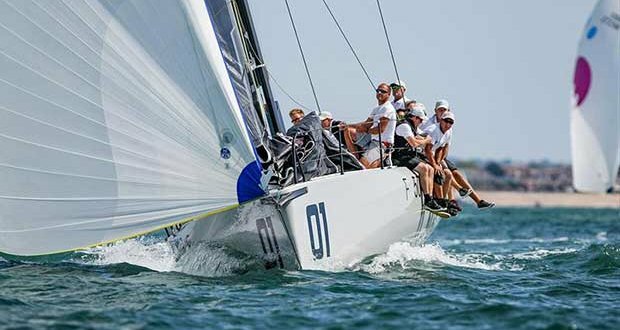 Three boats had a close fight at the top of the Contessa 32 fleet, with Martin and Donna Rouse-Collen’s Andaxi taking the overall win on 13 points. Donna’s father, Ray Rouse’s Blanco took second place on 15 points, while Eldred Himsworth’s Drumbeat was just one point adrift in third place. Charles Esse’s X4.3 Baby X took victory in Cruiser Division A, counting a straight run of first places. Two local boats completed the podium, with Pete Newland’s First 40.7 Anticipation taking second place one point ahead of Derek Saunder’s Corby 45 Incisor. Cruiser Division B was won by David McDonald’s First 33.7 Zenith, ahead of Karen Harris and Adam James’ First 31.7 Fleur de Sel. Peter Dickson and Andrew Yates’ First 25.7 Start-Born 4 won Cruiser Division C with a three point margin, ahead of a pair of boats that tied on points. Andrew and Rebecca Buchanan’s Mustang 30 Haggis 2 took second place on count back ahead of Will Smyth’s Westerly Fulmar Panda of Hamble. Stephen Hopson’s JPK10.80 Blue Note took overall victory in the new Double-Handed class, ahead of a pair of J/105s – Natalie Jobling’s Mostly Harmless and Andy Roberts’ Jin Tonic. Local Quarter Tonner Aguila, owned by Sam Laidlaw, won every race to take victory in the Quarter Ton fleet, ahead of Louise Morton’s Bullet and Julian Metherell’s Bullit. Tenzing sailed a similarly impressive series in the Sunsail Match F40 class to take an overall win counting just six points. A pair of third places in the final two races lifted Lendy into second place, four points ahead of Opihr. Having won the HP30’s short series held over the first four days of Lendy Cowes Week, Malcolm Wootton’s Farr 30 Pegasus Dekmarx won the overall HP30 class, ahead of Glyn Locke’s Farr 280 Toucan and Richard Woof’s J/90 Jo 90. The Squib class used the opening race of Lendy Cowes Week as a practice race for the Nationals and their championship also ended on Friday, so there was potential for a different Cowes Week class winner. With Warren-Smith not competing today and having started prematurely on the opening day of the regatta, he was not able to discard the 34th he picked up on Thursday. This left Nigel Grogan’s Helmut Shoing ll poised to be overall class winner in Lendy Cowes Week. However, he was one of eight boats scored OCS in today’s race. Fortunately for Grogan, Josh Metcalfe and Mark Hogan’s Rico’shea, which had been holding second overall, was forced to retire, leaving Helmut Shoing ll as overall victor. Rico’shea retained second overall, while a second place today for Alex and Mark Downer’s Panther 3 lifted them to third overall, and a win for Malc Hutchings and Andy Ramsey’s Lady Penelope elevated them from eighth to fourth. In the XOD class a win today for John Tremlett’s Lass ahead of Roger Yeoman’s Xcitation and Colin McKinnon’s Catherine left the top of the leaderboard unchanged. Lass took another overall win by a margin of 14 points ahead of James Meaning’s Gleam, with Al Asford’s Foxglove a further nine points back in third overall. Today’s good result for Catherine lifted her to fourth overall, a single point ahead of Simon Russell’s Swallow and just 2.5 points ahead of Xcitation. The Dragon class started the final day with the leaderboard wide open – Eric Williams’ Ecstatic was one point ahead of Oliver Morgan’s Christianna. Richard Jordan’s Sankher started today’s race mid line as the furthest inshore boat, while Gavia Wilkinson-Cox’s Jerboa was a length and a half ahead of Jenny Stutley’s Chime and Andrew Millband’s Supremacy mid-line. Ecstatic was also looked nicely placed as the furthest offshore boat, but initially Christianna was languishing far behind in their wake. The latter headed inshore across the mouth of the Medina, into less adverse tide and rapidly picked up ground, before dropping back to seventh at the finish. Williams retained the lead to take a 10th Dragon class overall victory at Lendy Cowes Week, seven points ahead of Christianna. Jerboa took third overall. Two former world champions battled it out at the top of the Flying 15 fleet all week – Rupert Mander in Men Behaving Badly and Charles Apthorp in Fourwinds. The pair started the day with Fourwinds holding a single-point advantage. The Manders won today’s race, 20 seconds ahead of Apthorp, who was racing with his 16-year-old son Timothy. The two boats therefore finished the series on equal points, with the tie break resolved in favour of Mander and his father John. Mike Dixon’s Fflashback finished third overall, even though race officer duties prevented him competing today. A win today for Glynn Williams’ J/70 EV Experts ahead of Abi Hayles’ CSC and Kris Thompson’s Cosmic failed to lift Williams onto the overall podium and he finished the series fourth overall. Paul Ward’s Eat, Sleep, J, Repeat took overall victory, with Marshall King’s The Janitor taking second just one point ahead of Simon Cavey’s Just4Play. Matt Williams’ SB20 Carnage finished the regatta first overall, ahead of the Waha Waite McLean Youth Team’s Spongbob in second. In the Etchells class Martin Hill and Andrew Palfrey’s Man’s Best Friend held the overall lead at the start of the final day by six points, which proved unbeatable. However, in the race for second overall Shaun and Emily Frolich’s Exabyte was tied on points with Rob Tyrwhitt-Drake’s Desperate. Today Desperate was marginally early on the line and had to luff, her spinnaker flogging briefly, before bearing away nicely positioned in clean air to windward of Man’s Best Friend and Exabyte. Tom Abrey’s Jolly Roger led the fleet home to the finish, ahead of Man’s Best Friend, with Exabyte finishing third. With Desperate retiring from today’s race, she had to count a ninth place picked up on the opening day and dropped to fourth overall, with Jolly Roger taking third place behind Exabyte. Jon Powell’s J/80 Betty has had another stunning week, winning five races to take overall victory with a score of eight points. Ray Mitchell’s Checkmate took second with 15 points and Chris Body’s MockingJay third on 20 points. Another win today – her fifth of the regatta – for David and Kirsty Apthorp’s J/88 J-Dream extended her overall lead in the IRC Sportsboat class ahead of Boss Hogg’s modified Cork 1720 Spider Pig. Another Cork 1720, Paul Lewis’s Rum n Cork took third overall. John Raymond and Matt Alexander’s Harlequin won the Redwing class with a day to spare, but there was a close tussle for second overall between James Wilson’s Quail and Hugo Cuddigan’s Capella ll. Quail won today’s race, sealing her overall runner’s up position ahead of Capella ll and Nick Woolgar’s Goose. Alistair Barter’s Bertie has dominated the Sonar fleet this year, but the rest of the class has seen tense and close racing, with only four points separating places four to eight going into the final day. Bertie finished the series with an impressive 22 point lead, ahead of Rob Peace’s Miscreant. James Holman’s Biscuit took third place overall and a third place in today’s race elevated Charlie Laurence-Fuller’s Josh to fourth overall. Roger Wickens’ Danny took another decisive victory in the Sunbeam class, notching up four first places, a second and a third. Stewart Reed’s Firefly was second overall, also counting only podium places, while Julian Money’s Penny took third. Ossie Stewart’s More T Vicar won the RS Elite class ahead of Russell Peters’ Riff Raff and David Hitchcock’s Aurora.In the Victory class John Scammell and Maxine Reeves’ Zinnia emerged victorious, two points ahead of Russell Mead’s Shearwater ll and Hugh Pringle’s Pelican. The Mermaid class started the final day with three-way battle for the top spot, led by Ben Few-Brown’s Sheen. Hugo Mills’ Halluf and Elizabeth Windridge’s Serena were first away after the start today, with the former eeking out a good early lead in challenging light and bouncy conditions. Halluf went on to win today’s race, with Noel Dobb’s Rosemary second, but Sheenhad a disappointing day, finishing half an hour later in 10th place. This left. Halluf as overall winner ahead of Rosemary, with Sheen just holding on to third overall. The sailing inspired programmes run by Lendy Cowes Week’s official Charity, the 1851 Trust, reached over 90,000 young people in the last year and ran a programme of workshops and treasure hunts from its stand on the Parade throughout Lendy Cowes Week. The organisation aims to inspire more young people about the opportunities open to them through sport and technology, leading them to think differently about their futures. Anyone wanting to give more young people to the opportunity to grow through sailing can donate £10 by texting INSPIRE to 70660. More information on the 1851 Trust here. Overall Lendy Cowes Week results are available on the event website. Canada to return Vendée Globe in 2016?